We are inspired by every country in which we work. But India, in particular, holds special meaning to the Free The Children’s WE Villages team, because our story starts here. It was on a trip through South Asia in 1995 that Craig Kielburger witnessed firsthand the working conditions of child laborers. Three years later, with a small group called WE Charity, he set out to build a rescue home in India for freed child laborers. It was clear from the beginning there was no quick fix to the problem of child labor, which impacts at least 12% of Indian children, and is rooted in systemic poverty. More than a quarter of India’s population lives below the poverty line, and nearly half of all children in rural areas are underweight. Only half of girls attend secondary school, and 35 percent of women are illiterate. 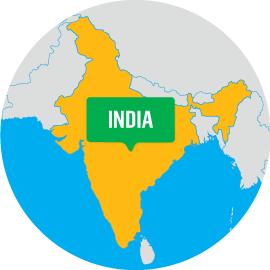 We began working in India in 1998. In 2008, India officially joined our list of Free The Children’s WE Villages partner countries, and we’ve since seen incredible progress in the communities in which we work. We have successfully built and refurbished hundreds of schools, created health centers, organized women’s alternative income groups and more. 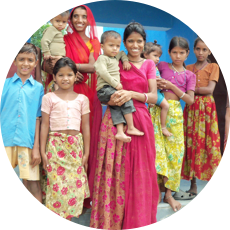 Our WE Villages projects in India take place in the Udaipur and Rajsamand district in the northern desert state of Rajasthan, which suffers from many environmental, economic and social crises. Girls in India, specifically among tribal populations of Rajasthan, experience a great number of gender disparities—they have the highest female illiteracy rate in the entire country. Child labor is also a rampant throughout the region. Our goals here are to combat child labor, and provide access to education for the indigenous and most marginalized people. Here’s how we’re doing this. The community of Lai in northwest India has a population of approximately 700 people, of which 250 are children. In 2008, the community had one local school with two classrooms serving grades 1 through 3. Students were taught by a single teacher and the school had no furniture or learning materials such as books or pencils. Enrollment was low, and so was attendance. Girls were discouraged from attending school. Unsafe drinking water, improper health practices and little or no access to health care meant children missed school because they were sick. WE Charity has built five classrooms, and expanded the school to Grade 5. This has brought more teachers to the school. Enrollment and attendance have both seen a steady increase. Enrollment and attendance have both seen a steady increase. In 2008, only about 20 percent of school-aged children were enrolled. By 2015, this number increased to over 50 percent. Girls are encouraged to attend school and enrollment of female students nearly equals that of male students. Overall academic performance has improved. In the warm climate of India, waterborne diseases are easily spread. Cross-contamination of drinking water was a major issue in Lai. To reduce cross-contamination, WE Charity has drilled wells, constructed storage tanks in the community and built hand-washing stations and latrines on school grounds, ensuring 100 percent of students have access to safe, clean drinking water. To ensure the sustainability of these projects, community members also receive sanitation education. Community members from Lai have taken ownership of health projects including care and management of the medicinal garden. WE Charity’s health programing in India includes both Ayurvedic (ancient Indian medical tradition based on Indian philosophies of health and wellness) and Allopathic (derived from western medical tradition) to provide both reactionary and preventive health care. In Lai, WE Charity has completely rehabilitated the local anginwadi—or local health resource center—and has been conducting disease prevention workshops in the community, as well as deworming students. 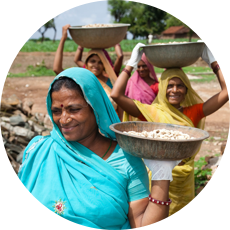 Women are leading the charge among projects implemented as part of the opportunity pillar. Women’s groups empower women, making them self-sufficient, improving their confidence, spreading awareness about how to care for common health concerns, promoting education, and reducing the rate of early marriage. 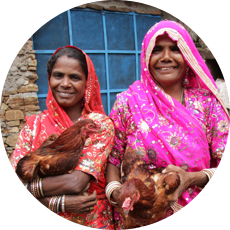 These women are substantially increasing their yearly income through a special goat-breeding program. At eight years old, Manju already knows what she wants to be when she grows up: inspired by her teacher, she wants to help her community by becoming a teacher herself. So, every morning at 6:00 a.m., Manju wakes up excited to go to school. She eats breakfast, says goodbye to her mother, Nanking, and her father, Babu, and heads to class. By 7:15, Manju is sitting in one of the five classrooms WE Charity has helped the community of Lai to build. Her favorite subject is English, but she enjoys the lessons on writing and reading as well. At 10, she enjoys a lunchtime meal prepared in the school kitchen and, now well fed, she is ready for the rest of her lessons. The school day ends at noon, but there is time enough to play with her friends in the garden before she has to go home. Her afternoon is spent studying and helping around her parents’ farm: things need to be tidied up and the cows need to be fed. At 5:30 she goes off to fetch water and firewood to help prepare dinner. In the past, this task would have taken hours. Manju would have walked miles to the nearest water source and then walked miles back carrying a heavy jug of water. This trek might have taken all day, which would have prevented her from going to school. But thanks to the work being done on the well, Manju can go to school and still help out her family. By 7:00, everyone has eaten dinner, and while she helps her family clean up, she asks her sisters how their day was. When the plates and pots are put away, there is still half an hour before she needs to go to bed, so she decides to study a little more. But she’s careful to go to bed by 9:30. Like today, tomorrow is a busy day, and so she needs to get lots of sleep. Manju’s day serves as a reminder that thanks to the improvements in Lai, the barriers that would have otherwise prevented her from getting an education have been removed. Now Manju has the support needed to chase her dreams—and that’s what really matters.